Just in time for the holidays, Odyssey has released its popular 24″ Hazard Lite complete wheels in hard anodized red. Front wheels are laced to the Vandero 2 hub and rear wheels are laced to the V3 cassette. It’s been a while since I’ve rocked the red anodized…but I’m digging the look of these wheels….if you are too, check your local shop or mailorder because they’re available now. I had Flatland Fuel order a set for me. Can’t wait to see them on Christmas day…. should look awesome with my Liquid frame. when the “red light’s on the porch, use the back door”! These are what I am running on my hog right now. 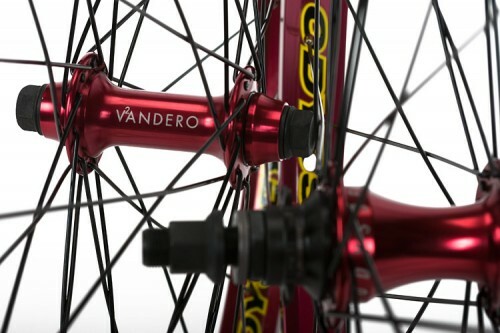 But I relaced the wheel with the ano red colored spokes for an all red wheel. These wheels also come in an all black….AND Odyssey makes a 24″ rim strip now as well. 24 inches of fury!!! I just got a set of 24s with GSport Rachet and marmoset hubs in gold. Hazard lites 24s in gold, and the red spokes. It is Sick. Got some updated pics of the Sunday Model-C with the gold Odyssey parts. Highly recommended. What size frame do you have in the pics? I think it is 21.25. I ordered it a complete, and there was only one option then.